Nepal’s capital city of Kathmandu is one of the world’s must-go destinations for wayward travellers looking to experience the vibrancy of Asia’s urban landscape. The city is located at the base of the mighty Himalayan mountain range, making it base camp for many a mountaineer looking to set out and conquer those hazardous peaks. Of course it’s not just the mountains that makes visiting Kathmandu worthwhile. If you care to venture forth into the city, you’ll find a treasure trove of sights to see and activities to undertake, all the while exposing yourself to the hustle and bustle of the local culture. Kathmandu itself is a noisy city, a cramped environment full of people and goods and constantly alive with activity. Simply walking down the street can be quite a chaotic experience; looking up at the thick stands of electrical wire hanging from building to building while you’re harangued by street merchants selling their wares. That’s not to mention the mopeds weaving in and out of traffic with little to no regard for pedestrians, or even cars squeezing down alleyways barely wide enough for them to fit, blaring their horns at everything in their path as they go. Kathmandu is certainly a noisy city, but that noise is the beating heart of a people and culture. Sharply contrasting the chaos and bustle of the rest of Kathmandu, the Boudhanath Stupa is an oasis of calm and tranquillity in this otherwise busy city. 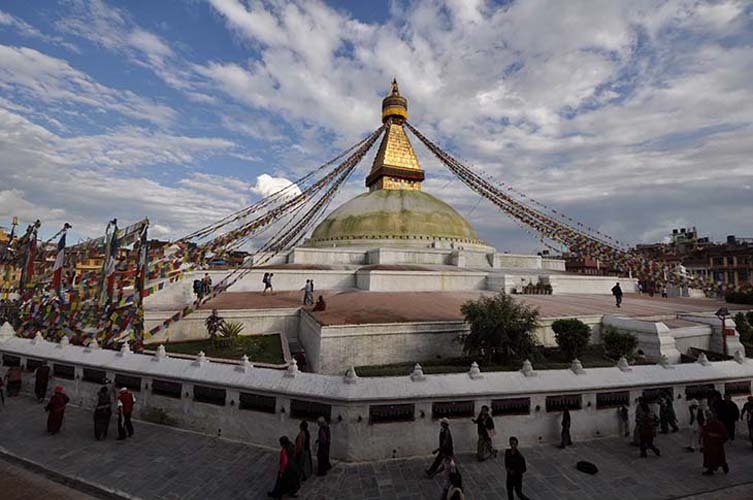 The stupa is one of the holiest and most recognisable sites in the city, it being a combination of Buddhist and Tibetan cultures. While you’re visiting, you’ll be able to see people practicing their religion which can be rather fascinating. However, you should keep in mind one rule while visiting, and that is to always walk through the temple in a clockwise direction as it’s seen to be bad luck not to. The best time of day to go would be either late afternoon or early morning. These times mean you can avoid the rush of tourists, and if you’re lucky in the mornings you can see the Buddhist monks undertaking their morning prayers. Alternatively, you can choose to take the bull by the horns and dive straight into the chaos of Thamel, the market hub of Kathmandu. For explorers willing to tackle the throng of people, there is a wealth of different things to enjoy. The markets offer up all kinds of different delights, from souvenirs, knockoffs of souvenirs, local food and goods. The place is a labyrinth of sights, smells and experiences and if all of that starts to get to you, there’s always the option of visiting the tranquil Garden of Dreams nearby for a respite. The Pashupatinath temple is another of Kathmandu’s holy sites, except instead of Buddhism, the temple is Nepal’s most important Hindu place of worship. Although non-Hindu’s are not permitted within the temple itself, there’s nevertheless much to see. You can behold the exterior of the temple which is constructed in the pagoda style of architecture and sits on the banks of the Bagmati River and is surrounded by smaller temples frequented by Hindu holy men, known as Sadhus. There are also traders that sell souvenirs such as incense, conch shells and marigolds. Or, if you’re feeling particularly curious, you can venture down to the Bagmati and bear witness to one of the frequent cremations that occur there. It’s a tradition that’s very important to these people even if it might seem a touch morbid from a Westerner’s viewpoint. Just watch out for the smoke. Of course, there is one reason so many tourists flock to Nepal every year and that reason is the Everest region. Nepal is home 8 of the world’s 14 mountain peaks that reach over 8000 feet (the other 6 of which are also part of the Himalayas). From Kathmandu, the only way to reach the Everest region is by a 30 minute flight in a small plane to Lukla airport, and from there you’ll have to trek for two days to Namche Bazaar, the main town of the Everest region. If you want to proceed to Everest base camp, it’ll be another week’s trekking after that. Well, climbing the Himalayas was never supposed to be easy. 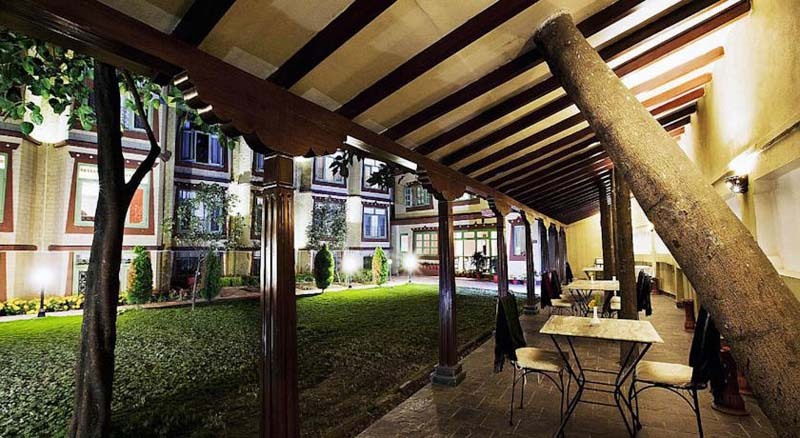 After all off that adventuring in and around Kathmandu, you’re going to need someplace to lay your weary head. The Shambaling Boutique hotel is just a 10 minute walk from the Boudhanath Stupa and built in a renovated Tibetan style house. The hotel’s design closely follows many Tibetan asthetics and every floor represents the Kalachakra elements of earth, fire, water and sky.